The Québécois share cultural commonalities with the Irish, as can be seen in their traditional music and Catholicism. Many Irish moved to the province, and as a result it is not unusual to meet Québécois people who cannot speak English, but have family names like "Johnson," "Myles," and "O'Neill." Many of them were found among the ranks of the Patriot Party during the Lower Canada Rebellion in 1837-39. 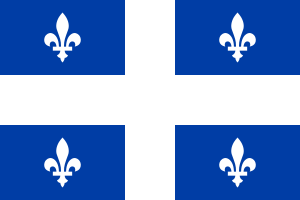 Quebec is the starting point for a fair share of Conspiracy theories. We'll save you the history on this, and instead sum it all up with one sentence: Quebec also produced The Vigilant Christian, so, yeah, whether this is testament to Quebec's general sanity we will leave up to you to decide. This page was last modified on 21 April 2019, at 23:51.